A gang of over 30 members attempted to murder rowdy-sheeter Ashok Pai at his mother-in-law’s residence in Madarahalli near Bharathinagar village in Mandya in the wee hours of yesterday. However, Ashok Pai, who was released from jail two months ago in connection with the murder of Jadeja Ravi,managed to escape miraculously along with his daughter by throwing vessels at the attackers from the attic where he hid after sensing trouble. The gang of about 30 miscreants, who had sketched to kill Ashok since his release, came in a car, goods tempo, Tata Ace and bikes, rushed inside the house breaking open the main door of the house around 3 am. It is reported that the incident occurred minutes after Ashok called up his wife Nagamma, who was attending to his ailing mother at Sanjo Hospital in Ummadahalli. Hearing some noise, Ashok woke up. Sensing the danger, he hid with his daughter Devika inside the attic. When the attackers saw him hiding inside the attic, they attempted to kill him. However, Ashok, along with his daughter, managed to escape from the scene after breaking open the asbestos sheet used for roof. On seeing the neighbours, who woke up on hearing the sound, coming to Ashok’s rescue, the attackers fled the scene. 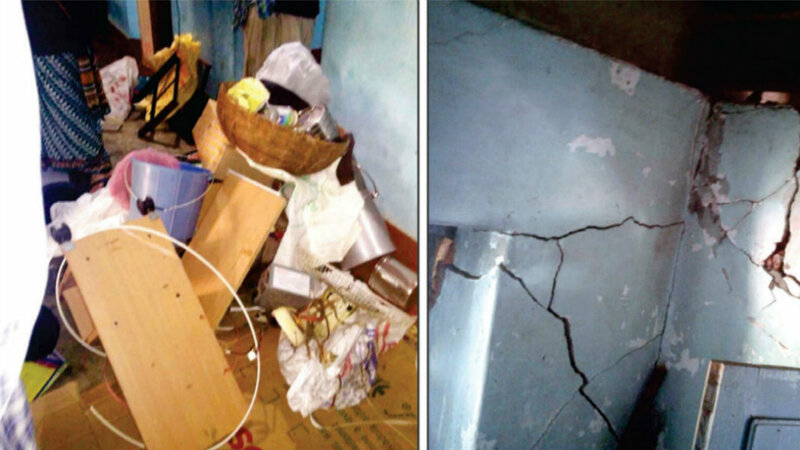 The attackers, who failed to catch Ashok, have destroyed the furniture and home appliances in the house before fleeing. Ashok, who sustained minor injuries, is undergoing treatment at a hospital. Cops, who visited the house of Ashok on receiving information, seized chilli powder, cell phone and lethal weapons, left behind by the miscreants. SP Sudheer Kumar Reddy and Dy.SP Mathew Thomas visited the house and obtained details. A case has been registered at K.M. Doddi Police Station and investigation is underway. The villagers are living in fear as there has been a spate of attempts to murder and murders in the district in the recent past. He had been released recently: It is learnt that Ashok, who had been sentenced to life by the District Sessions Court in Mandya along with 11 others in connection with the murder of Jadeja Ravi, had been released recently after the High Court quashed the District Court sentence recently. Series of murders: Tuesday’s attack on Ashok, said to be an act to avenge the murder of Jadeja Ravi, is one of the series of murders that have been reported from the District in the recent past.